Were Giant Australian Animals Really Wiped Out by Humans 65,000 Years Ago? Giant kangaroos and tortoises as big as cars that once roamed Down Under weren’t killed off by humans, according to scientists. Modern archaeological research suggests that the first settlers reached the remote continent at least 65,000 years ago – almost 20,000 years earlier than previously thought. This means that humans lived alongside Australia’s huge and astonishing creatures for thousands of years. Although they hunted them with spears for food and clothes, they are not likely what caused the extinction of Australia’s megafauna. The megafauna include giant kangaroos that weighed half-a-tonne, 2-tonne wombats, 8 metre (25-foot) long lizards, 190-kilogram (419-pound) flightless birds, 140-kilogram (309-pound) lions, and tortoises the size of cars. More than 85 percent of Australia’s mammals, birds, and reptiles weighing more than 50 kilograms (110 pounds) went extinct around 45,000 years ago. It has been debated for years whether climate change or humans wiped them out. In recent times, scientists have found proof that Aboriginal people have been in Australia for at least 65,000 years—much longer than the 47,000 years believed by some archaeologists. The evidence comes in the form of ochre “crayons” and other pigments. Edge-ground hatchets, which are believed to the oldest in the world, have also been found along with evidence that these early humans ground seeds and processed plants. It is thought that the pigments were used for symbolic and artistic expression, while the tools may have been used to cut bark or food from trees. Professor Ben Marwick, an anthropologist at the University of Washington, said that the findings challenge prevalent theories that place humans in Australia anywhere between 47,000 and 60,000 years ago. It calls into question the argument that humans caused the extinction of unique megafauna such as giant kangaroos, wombats, and tortoises more than 45,000 years ago. He said: “Previously it was thought humans arrived and hunted them out or disturbed their habits, leading to extinction, but these dates confirm people arrived so far before that they wouldn’t be the central cause of the death of megafauna. “It shifts the idea of humans charging into the landscape and killing off the megafauna. There is strong evidence though that humans did eat the megafauna. In 2016, scientists revealed burned eggshells of the 190-kilogram (420-pound) bird, Genyornis, as the first direct evidence humans actually preyed on these weird and wonderful beasts. Marwick and his colleagues used state-of-the-art techniques to date artifacts from a cave at Madjedbebe in Australia’s Northern Territory, where over 10,000 stone tools, ochres, plant remains, and bones have been unearthed since 1973. The site is located on the traditional Aboriginal lands of the Mirarr people surrounded by the World Heritage‐listed Kakadu National Park. Following the most recent excavations of the cave in 2012 and 2015, the team—led by researchers at Queensland University—analysed and evaluated artefacts found in various layers of settlement. They combined radiocarbon dating with a technique known as OSL (optical stimulated luminescence), which can date minerals with remarkable accuracy. For instance, it can tell, up to 100,000 years ago or more, the last time a grain of sand was exposed to sunlight. This is helpful in determining when an artefact was buried. Using this process, thousands of sand grains were individually measured so as to establish with relative precision the age of the artefacts. The Gundjeihmi Aboriginal Corporation, representing the Mirarr people, joined much of the excavation and reviewed the findings, said Marwick. The Mirarr were interested in supporting new research into the age of the site and in knowing more about the early human occupants—particularly given environmental threats posed by nearby modern-day mining activities. 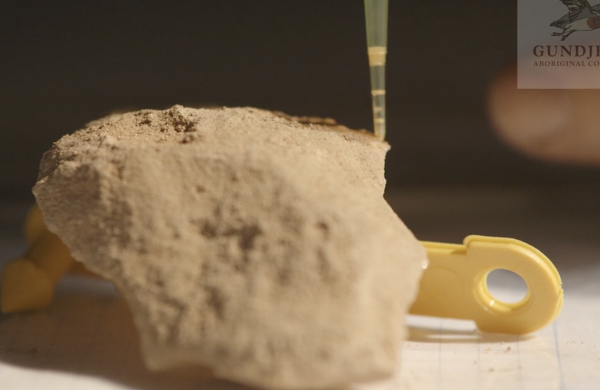 Students at the University of Washington’s campus in Seattle tested the sediment samples that Marwick helped excavate at Madjedbebe. Using a scanning electron microscope, they studied the properties of hundreds of dirt samples and microscopic plant matter to try and picture the time in which the ancient Australian people lived. The findings place the date of Australian settlement at around 65,000 years ago. This means that these early Australians preceded early Europeans, who are believed to have entered that continent 45,000 years ago. In recent years, further evidence obtained through DNA testing of a 90-year-old hair sample from an Aboriginal Australian man, suggested that Australia was settled as far back as 70,000 years ago, corroborating the latest findings. Scientists have been debating the causes of the Australian megafauna extinctions for decades. Others have suggested the animals were hunted to extinction by Australia’s earliest immigrants who had colonised most of the continent by 50,000 years ago, or a combination of overhunting and climate change.